According to the Journal Citation Reports, the Harvard Law Review's 2015 impact factor of 4.979 placed the journal first out of 143 journals in the category "Law".<re> "Journals Ranked by Impact: Law". 2011 Journal Citation Reports. Web of Science (Science ed.). Thomson Reuters. 2012. </ref> It is published monthly from November through June, with the November issue dedicated to covering the previous year's term of the Supreme Court of the United States. The journal also publishes the online-only Harvard Law Review Forum, a rolling journal of scholarly responses to the main journal's content. The Harvard Law Review Association, in conjunction with the Columbia Law Review, the University of Pennsylvania Law Review, and the Yale Law Journal, publishes the Bluebook: A Uniform System of Citation, a widely followed authority for legal citation formats in the United States. The Harvard Law Review published its first issue on April 15, 1887, making it one of the oldest operating student-edited law reviews in the United States. The establishment of the journal was largely due to the support of Louis Brandeis, then a recent Harvard Law School alumnus and Boston attorney who would later go on to become a Justice of the Supreme Court of the United States. From the 1880s to the 1970s, editors were selected on the basis of their grades; the president of the Review was the student with the highest academic rank. The first female editor of the journal was Priscilla Holmes (1953-1955, Volumes 67-68); the first woman to serve as the journal's president was Susan Estrich (1977), who later was active in Democratic Party politics and became the youngest woman to receive tenure at Harvard Law School; its first non-white ethnic minority president was Raj Marphatia (1988, Volume 101), who is now a partner at the Boston law firm of Ropes & Gray; its first African-American president was the 44th President of the United States Barack Obama (1991); its first openly gay president was Mitchell Reich (2011); its first Latino president was Andrew M. Crespo. The first female African-American president, ImeIme Umana, was elected in 2017. Gannett House, a white building constructed in the Greek Revival style that was popular in New England during the mid-to-late 19th century, has been home to the Harvard Law Review since the 1920s. Before moving into Gannett House, the journal resided in the Law School's Austin Hall. Since the change of criteria in the 1970s, grades are no longer the primary basis of selection for editors. Membership in the Harvard Law Review is offered to select Harvard law students based on first-year grades and performance in a writing competition held at the end of the first year except for twelve slots that are offered on a discretionary basis. The writing competition includes two components: an edit of an unpublished article and an analysis of a recent United States Supreme Court or Court of Appeals case. The writing competition submissions are graded blindly to assure anonymity. Fourteen editors (two from each 1L section) are selected based on a combination of their first-year grades and their competition scores. Twenty editors are selected based solely on their competition scores. The remaining twelve editors are selected on a discretionary basis. According to the law review's webpage, "Some of these discretionary slots may be used to implement the Review's affirmative action policy." The president of the Harvard Law Review is elected by the other editors. 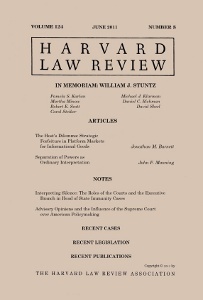 It has been a long tradition, apparently since the first issue, that the works of students published in the Harvard Law Review are called "notes," and they are unsigned as part of a policy reflecting "the fact that many members of the Review besides the author make a contribution to each published piece." Ketanji Brown Jackson, judge of the United States District Court for the District of Columbia, supervising editor of volume 109. Gregory G. Katsas, judge of the United States Court of Appeals for the District of Columbia Circuit, executive editor of volume 102. Kevin C. Newsom, judge of the United States Court of Appeals for the Eleventh Circuit, articles editor of volume 110. Learned Hand, late judge of the United States Court of Appeals for the Second Circuit, served as an editor but later resigned. Robert Stanfield, former Premier of the Province of Nova Scotia, and former leader of Canada's Official Opposition. He was the Review's first Canadian editor in the late 1930s. ^ Friedman, Lawrence M. (2005). A History of American Law (3rd ed.). New York: Simon & Schuster. p. 481. ISBN 0684869888. ^ Greenfield, Jill (2011). ""She Rose Above Obstacles With Ease" Priscilla Holmes '55: 1924-2010". Harvard Law Bulletin. ^ Griswold, Erwin N (1987). "The Harvard Law Review — Glimpses of Its History as Seen by an Aficionado". Harvard Law Review: Centennial Album I. Retrieved 2012-05-02. ^ "Women and Law Review: An Historical Overview". Retrieved 2013-07-18. ^ "Raj Marphatia: Biography". Ropes & Gray. Retrieved 2012-05-02. ^ a b c d Butterfield, Fox (February 6, 1990). "First Black Elected to Head Harvard's Law Review". The New York Times. Retrieved 8 September 2017. ^ a b Kantor, Jodi (January 28, 2007). "In Law School, Obama Found Political Voice". New York Times. Retrieved 2008-01-04. ^ McKay, Caroline. "Harvard Law Review Elects First Openly Gay President". The Harvard Crimson. Retrieved 13 April 2011. ^ a b c "Harvard Law Review Membership Selection Policies". Harvard Law Review. Retrieved July 9, 2014. ^ a b Obama, Barack. "Review President Explains Affirmative Action Policy (letter)". The Harvard Law Record. Retrieved August 3, 2012. ^ "Prospective Transfer Students Applying for Membership". Harvard Law Review. Retrieved July 9, 2014. ^ Seo, Jane (February 7, 2012). "Tochilin '06 elected president of Harvard Law Review". The Harvard Crimson. ^ "About the Harvard Law Review". harvardlawreview.org. Retrieved 2018-04-23. ^ District Judge Ketanji Brown Jackson profile, USDC District of Columbia. ^ Office of the Solicitor General, U.S. Department of Justice, Solicitor General Charles Evans Hughes, Jr.
^ Finn, Peter (June 23, 2011). "Pentagon names new Guantanamo prosecutor". The Washington Post. ^ Fraser, Graham (2003-12-18). "The best PM Canada never had". The Toronto Star. p. A10. ^ "Faculty". Yale Law School. Retrieved 18 November 2014. ^ Office of the President, University of Texas, Biography: William Powers Jr.
^ Barnes, Bart (June 1, 2016). "Bennet Boskey, Washington lawyer, dies at 99," Washington Post. ^ Columbia College Today, "Alumni News: A Passion for Civil Liberties"